During the far reaching Fiat Auto Investor Presentation today at Lingotto Alfa Romeo outlined in some detail its forthcoming model plans, confirming that a new small car, codenamed "Junior", a new crossover, the "CXover", and the large sporty sedan, the Alfa 169 are all in the development pipeline. The Alfa Romeo presentation initially focused on the new Alfa 159, emphasising that its perception as a "premium" product since it arrived on the market a year ago is much higher than was ever achieved by the Alfa 156, the popular model it replaced last year. With its average price up 13 percent it is able to support a higher list price and offer a wider range and great mix of models. Residual values have improved, in Italy the 159 has a residual value of 53.0 pct compared to 40.8 pct for the 156. In Germany the story is similar: the 159 has a value of 47 pct, as opposed to the 156's 38 pct. Analysing its customers Alfa Romeo see that the audience is currently split between younger drivers and older "Alfisti" (so called "empty nesters"). 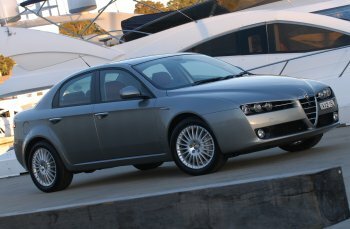 The C-segment Alfa 147 appeals primarily to the 25-37 year old age range; the GT Coupe to the 34-45 range; while the new breed of models attract slightly older buyers, the Brera and Spider (34-45) and the Alfa 159 (45-55). Of concern to Alfa Romeo is their lack of penetration in the area of young families (with children) and this is an immediate priority to the brand to rectify. At present the home Italian market accounts for 45.6 percent of the brand's sales, with the four major European Union (EU) markets (France, Germany, the UK and Spain) taking 29.0 pct of total sales. The remaining EU member nations absorb 18.1 pct of registrations, while Japan takes 2.5 pct. With a highly ambitious target of 300,000 unit sales by 2010 being set by Fiat CEO Sergio Marchionne, Alfa Romeo will look to broaden the age range it targets. The CXover, say Alfa Romeo, will be "a sporty crossover in between an SUV and a coupé. Around 4.6 metres in length its price will range from 28-45,000 euros. Above: sketch of the CXover as part of the presentation today. The Alfa Romeo presentation initially focused on the new Alfa 159, emphasising that its perception as a "premium" product since it arrived on the market a year ago is much higher than was ever achieved by the Alfa 156, the popular model it replaced last year. Alfa Romeo describe the Junior in the presentation as an "innovative concept of a 3-door sporty car", just under 4 metres long and priced at 16,000 euros. It will arrive on the market during the second quarter of 2008. Above: sketch of the Junior as part of the presentation today. The Alfa 169, a large premium and sporty sedan will replace the Alfa 166; it will be over 4.9 metres long and priced between 40 and 55,000 euros. Above: sketch of the Alfa 169 as part of the presentation today. By 2010 it will be able to cover the 18 to over 55 age range with new products effectively targeted at each age group. The forthcoming Grande Punto based B-segment model, codenamed "Junior", will be positioned firmly against the 18-30 age group; the C-segment replacement for the Alfa 147, due in the first quarter of 2009 will push itself up the premium ladder, targeting the 27-40 age group; the Alfa 159 will broaden slightly to target the 43-55 age group; and the Brera/Spider, the 37-55 age range. These will be joined in the first quarter of 2010 by the CXover which will be positioned towards 34-48 year olds. The most interesting new model announcement during the presentation was that of the new B-segment car, codename "Junior", a spiritual successor to the must-loved Alfasud, itself a model that changed the face of Alfa Romeo forever when it arrived in the early 1970s. Senior management today believe that by giving the green light to the "Junior" they can recreate the magic of the Alfasud and build an evocative car, fused with the passion of the brand. Alfa Romeo describe the Junior in the presentation as an "innovative concept of a 3-door sporty car", just under 4 metres long and priced at 16,000 euros. It will arrive on the European markets in the second quarter of 2008. The second model to tackle a brand new segment for Alfa Romeo will be the "CXover", due to reach the market in the first quarter of 2010. This car, say Alfa Romeo, will be "a sporty crossover in between an SUV and a coupé. Around 4.6 metres in length its price will range from 28-45,000 euros. The third model in the period to 2010 will be the Alfa 169, a large premium and sporty sedan which will replace the Alfa 166; it will be over 4.9 metres long and priced between 40 and 55,000 euros. Due to arrive in the second quarter of 2009, it will target the over 55 age group.